In the twenty-ninth century, Louis Wu, a 200-years-young adventurer, became one of the first humans from Known Space to set foot on the Ringworld, and his exploits there became legends among many of the native races. During Louis Wu's second sojourn on the Ringworld, he was able to save it from total destruction... but several hundred million people died anyway, and that was a mighty weight on one man's conscience. But odd events on the Ringworld would require Louis Wu's attention once again: Vampires were gathering in untold numbers; Protectors, immensely powerful beings dedicated to safeguarding their own bloodlines above all else, were interfering with species not their own and with each other. If the Ringworld was to remain intact, it was going to need one central Protector of its own. 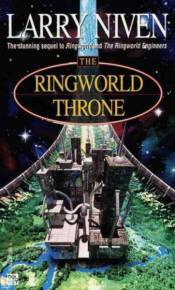 But who would sit on the Ringworld Throne?